[SatNews] SES (NYSE Euronext Paris and Luxembourg Stock Exchange: SESG) and Milano Teleport have signed a capacity and ground satellite infrastructure deal to provide connectivity to Mario Zucchelli, the Italian research station located at Terra Nova Bay, Antarctica, managed by the Italian National Agency for New Technologies, Energy and Sustainable Economic Development (ENEA). Ground infrastructure services at the SES teleport in Adelaide and satellite capacity on SES's NSS-9 satellite located at 183 degrees East will be used to provide data and voice services to ensure the team of Italian scientists remains connected to their families and research institutions back in Italy. "Due to the extreme weather conditions in Antarctica and the location of Mario Zucchelli, it is of utmost importance that we select a partner which is reliable and can ensure vital communications 24/7," said Umberto Gallo, CEO at Milano Teleport. "Having worked with SES since 2009 where we have been leasing capacity for broadcasting services as well as data and voice services, we are confident that SES is an ideal partner that can deliver the connectivity in even the most unfavorable weather conditions." Mario Zucchelli, the Italian research station located at Terra Nova Bay, Antarctica. "This is the second consecutive year that we are providing Milano Teleport with satellite services to connect Mario Zucchelli to the rest of the world. This latest agreement illustrates their level of satisfaction with the NSS-9 satellite and the quality of the services we have been providing," said Simon Gatty Saunt, Vice President of Europe Data and Mobility at SES. SES (NYSE Euronext Paris and Luxembourg Stock Exchange: SESG) and Milano Teleport announced today that they have signed a capacity and ground satellite infrastructure deal to provide connectivity to Mario Zucchelli, the Italian research station located at Terra Nova Bay, Antarctica, managed by the Italian National Agency for New Technologies, Energy and Sustainable Economic Development (ENEA). 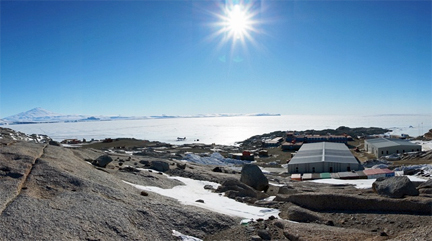 "Due to the extreme weather conditions in Antarctica and the location of Mario Zucchelli, it is of upmost importance that we select a partner which is reliable and can ensure vital communications 24/7," said Umberto Gallo, CEO at Milano Teleport. "Having worked with SES since 2009 where we have been leasing capacity for broadcasting services as well as data and voice services, we are confident that SES is an ideal partner that can deliver the connectivity in even the most unfavourable weather conditions." "This is the second consecutive year that we are providing Milano Teleport with satellite services to connect Mario Zucchelli to the rest of the world. This latest agreement illustrates their level of satisfaction with the NSS-9 satellite and the quality of the services we have been providing," said Simon Gatty Saunt, Vice President of Europe Data and Mobility at SES. "We look forward to working with them in the coming years and ensuring that the Italian research centre remains connected via internet access, video conferencing and data networks."